OUR PRICE: $25.08 - Join Rewards Get $1 Dance Dollars On This Item! Bloch's long sleeve dress features a round front and back neckline and an attached Georgette skirt. Hand wash in cold water, hang dry. Chest 20"-21" 21"-23" 23"-25" 25"-27" 27"-29" 29"-31"
Waist 18"-19" 19"-21" 21"-22" 22"-23" 23"-25" 26"-28"
Hip 21"-23" 23"-25" 25"-27" 27"-29" 29"-31" 31"-33"
Girth 32"-35" 36"-39" 40"-43" 44"-47" 48"-51" 52"-55"
Inseam 18"-20" 20"-22" 22"-24" 24"-26" 26"-28" 28"-30"
I really like this leotard and it looks like it will hold up well. However, my 5.5 year old tried this on and it is already snug on her. If your child is 5, I would size up. Unfortunately I cannot exchange this product for another size as I bought it on a sale. Disappointed in DDS's return policy and will not shop here again. Fits & looks great, very pleased. First time ordering dance apparel so wasn't quite sure I was ordering the correct size. 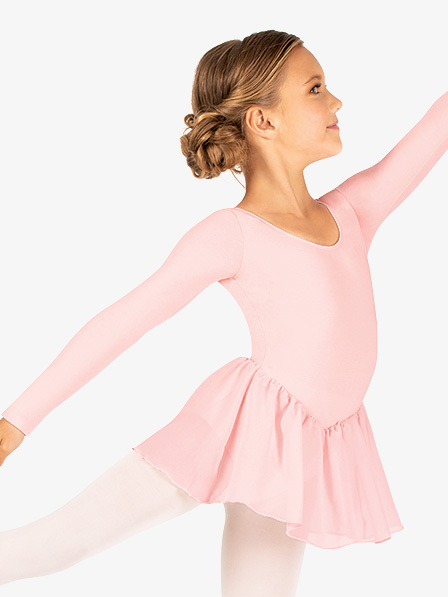 Our daughter wears a 10/12 top, ordered a size 12 leotard and it fits & looks great. We couldn't be more pleased. I purchased two leotards for my twin daughters. 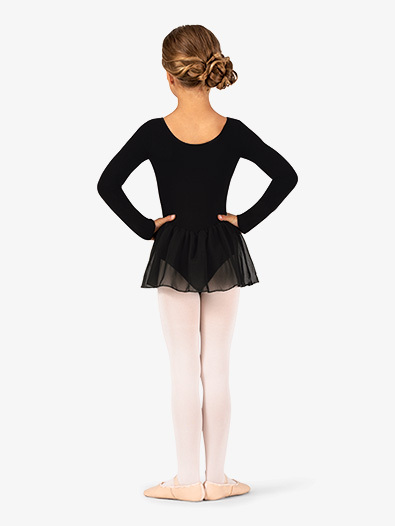 The leotards are very good quality , durable, and stylish. I would definitely purchase from Discount Dance Supply again. I bought two of these for my 4 1/2 year old twin girls. They are both tall, one is very slim and the other is husky. I ordered size 4/6 for both because they usually wear size 5. The body length is perfect while the sleeve length is super long. No problem - just one roll of the sleeve fixes that. The back of the neck dips down a little lower than I'd like but the girls don't complain and it doesn't seem to fall off or bother them. They love the sheer skirt. Will definitely buy again when they outgrow these. I bought this in a size S (6x - 7) for my 3.5 year old who normally wears a size 4 top. It's a bit baggy, but it's easy for her to get on and off, and with a little luck, she can wear it for two seasons!. The quality of the garment is great - it has a full lining, so she's warm in class, and after 10 washes it looks brand new. I'm buying another one as a birthday gift for her friend now. Highly recommend. Runs small but the quality is wonderful. I have to return the two that I bought for my grand-daughters since it's already tight on them. They wear a size 4T or 4 and I ordered size P. The inside of the leotard is lined and really looks comfortable so I'm not happy that I have to return it.